The Iraqi government has launched an inquiry into unofficial mobile phone footage showing the execution of former leader Saddam Hussein. The grainy video showed the former leader being told to "go to hell" by someone attending the hanging. One of the trial prosecutors who saw the execution said he threatened to halt it if the jeering did not stop. Munkith al-Faroon - who can be heard appealing for order on the unofficial video - said that he had threatened to walk out. This could have halted the execution, as a prosecution observer must, by law, be present. Mr Faroon also said he knew "two top officials... had their mobile phones with them [at the execution]. There were no mobile phones allowed at that time." Do you consider this bravery? The Iraqi authorities fear the footage, released on the internet hours after the execution, could contribute to a dramatic rise in sectarian tensions between Iraq's Sunni and Shia communities. "There were a few guards who shouted slogans that were inappropriate and that's now the subject of a government investigation," an adviser to Prime Minister Nouri Maliki, Sami al-Askari, told Reuters news agency. The BBC's Peter Greste, in Baghdad, says Iraq's government is desperate to clear the air, having hoped that the execution would signal the start of the reconciliation process between the Sunni and Shia communities. Saddam Hussein, a Sunni Muslim, was sentenced to death by an Iraqi court on 5 November over the killings of 148 Shias from the town of Dujail in the 1980s. He was executed before dawn on Saturday in Baghdad and buried near his hometown of Tikrit a day later. The daily cycle of violence in Iraq has continued since the execution. The Iraqi authorities released official footage of Saddam Hussein's execution to prove to the public that he was dead. But that film did not include any sound and did not show the actual moment of death. The grainy mobile phone footage that emerged later was shot from below the gallows. 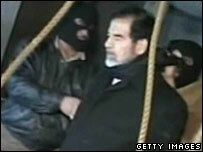 As Saddam Hussein is led towards the trapdoor, one of the unseen observers shouts "go to hell". Others can be heard chanting the name of Shia cleric Moqtada Sadr. One man calls out "Long live Mohammed Baqir Sadr", an assassinated Shia cleric, distantly related to Moqtada Sadr, who was a symbol of Shia resistance to Saddam. In response Saddam Hussein is sarcastic, asking "do you consider this bravery?" In a BBC interview, UK Deputy Prime Minister John Prescott condemned the surfacing of video clips on the internet. "Frankly, to get the kind of recorded messages coming out is totally unacceptable," he said.